Tonight I will be taking a plane to Australia. 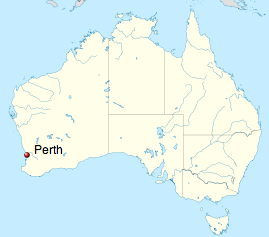 Once I make it to Australia, I will be headed to Perth, which is located in the south west part of the country, and then Serpentine, and then finally Bodhinyana monastery. I've mentioned my upcoming trip to various friends and relatives over the hoildays and I've been told, more often than not that, "you must be really excited!" To be honest, I don't really feel excited so much as I feel optimistic. I think I feel optimistic because it feels totally possible for me to slow down, to really slow down. Having kept (a modified form) of the 8-precepts with no egregious lapses for last two and half months has given me an incredible amount of inner self-confidence (i.e., I don't feel like I have to worry so much about my behavior). I've also recently quit my job in good standing and have helped my family with a lot of the transitionary duties that needed to be done, so I don't feel anything particularly pressing on me back in the non-monastic world. So, deep down, it feels totally fine for me to settle down, settle in, be quiet, and to not accomplish anything at all. I can just enjoy whatever happens in the day or during the meditations. I can hear and learn more Dharma (teachings) from the monastics. It feels nice. I also want to mention that I won't be writing any more entries blog for at least a month because computer access is not allowed at the monastery for visitors. So don't worry if you don't hear anything from me in a while. At the very least, I'll write something by April because that's when my visa expires and I have to leave the country. Until next time...have a happy and safe 2013. Hey my friend!! I'm so excited for you. I've sent you a wedding Save the Date for Sept 1 up here at a Fort in a National Park 3 hours outside Seattle. Hope you might make it. I sent it to your casa-z address.